Hyundai is celebrating the College Football season with a new Sweepstakes in 2017. Enter at the Hyundai display space during a college football game or online for a chance to drive home a 2018 Hyundai Sonata Sport. The Hyundai College Football Sweepstakes is open only to legal residents of the 48 contiguous United States and the District of Columbia who, at the time of entry, are at least 18 years of age or the age of majority in their states of residence, whichever is older, and have valid U.S. driver’s licenses. The Sweepstakes begins on August 31, 2017 at 12:00 PM ET and ends on November 25, 2017 at 11:59:59 PM ET. During a college football game, visit the Hyundai display space and complete the survey to enter the Sweepstakes. 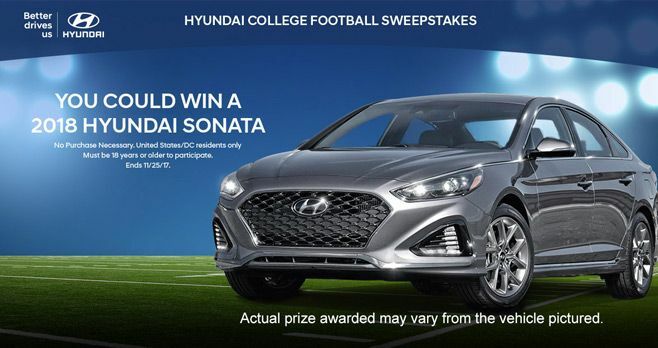 You may also go to hyundaicollegefootballsweepstakes.com and enter your valid e-mail address to access the online registration page for the Sweepstakes then, complete and submit the online entry form as directed. Limited to a maximum of one entry per person/email address per calendar day during the Sweepstakes Period, regardless of method of entry. The potential winner of the Sweepstakes will be selected by random drawing conducted by Sponsor or Sponsor’s designee on or about December 1, 2017 from among all eligible entries received. The potential winner will be notified at the email address, postal address, and/or telephone number. The Grand Prize consists of a 2018 Hyundai Sonata Sport 2.4L 6-Speed Automatic Transmission valued at $27,600. For the Winner’s name, mail a request and a self-addressed stamped envelope to be received by January 29, 2018 to: Hyundai College Football Sweepstakes, Winner’s List c/o Advantage International, 8687 Melrose Ave., G700, West Hollywood, CA 90069.